CALIFORNIA, San Francisco with Kids – Riding cable cars, sampling Ghirardelli chocolates, getting that Golden Gate family photo op, savoring clam chowder served in a sourdough bowl, and souvenir shopping in Chinatown–the first-timer’s San Francisco Travel Bucket List is long to say the least. And don’t even get me started on all of the great neighborhoods to explore across the city, each with its own brilliant cafes, bakeries, small restaurants, and intriguing shops. Yet if you’re like many traveling families I know, you’ll have to pack all your San Francisco fun into just a handful of days. So with that in mind, I’ve put together these strategic recommendations of 4 activities to prioritize, along with recommendations of 1 great place to stay and 1 great place to eat for those planning a first visit to San Francisco with kids (don’t miss the map at the end for planning). Here we go! Hop aboard for a narrated tour of San Francisco–by water! For any first-timer’s trip to San Francisco, a 1-hour narrated Bay Cruise is a great way to brush up on the city’s history while getting familiar with the landmarks you’ll continue to see throughout your stay. Not to mention, it’s just really fun to get out on the Bay! This voyage takes you along the San Francisco waterfront, under the Golden Gate Bridge, and right up close and around Alcatraz Island. In most cases, you’d be crazy not to grab the best seats you can outside as quickly as you can (top deck offers the best views) and stand ready for amazing photo ops. But in case anyone gets too cold or “winded” on deck, there is plenty of seating inside as well. Both the Red & White Fleet (departing from Pier 43 1/2) and the Blue & Gold Fleet (departing from Pier 39) offer similar 1-hour Bay Cruises several times throughout the day, each with kids under 5 riding free. Check their sites for the latest special offers, or take advantage of the Blue & Gold Fleet’s 1-hour cruise included with the San Francisco CityPass. More than 20,000 marine animals call Aquarium of the Bay home. After seeing San Francisco Bay by boat, it’s the perfect time to get acquainted with who’s living in its waters and off its nearby shores–including the shriek-worthy seven-gill shark and the four other shark species found in the Bay! You’ll also enjoy jellyfish, otters, and the opportunity to pet young bat rays and leopard sharks as they pass by–but it’s hard to top the 300 feet of glass tunnels with sharks, large rays, and other Bay Area marine life swimming on all sides as you pass through. The Aquarium of the Bay is located at Pier 39, and children under 3 years get in free. A beach with a Golden Gate view? Ready the camera for you holiday cards. Baker Beach is located on the Bay side with views of the Marin Headlands and the Golden Gate Bridge–not a bad place to spend some hours soaking up the magic of San Francisco Bay. On one of our family’s visits, we were even entertained by a pod of porpoises passing by! Inside the 90-foot diameter glass dome rainforest at the Cal Academy of Sciences. Your visit to the California Academy of Sciences, located in Golden Gate Park, will take you up through the layers of a four-story tropical rainforest living-learning dome replete with Blue Morphos and several other butterfly species flitting past–and perhaps even landing upon–you in the process (keep an eye out for frogs in the vines!). But one of the favorite moments in any kid’s visit here is the glass elevator plunge from the rainforest canopy down through the flooded forest floor with its sofa-sized fish swimming past. Upon exiting the elevator you enter into the Steinhart Aquarium section of the Academy of Sciences, which includes a 212,000 Philippine coral reef tank–one of the deepest exhibits of living coral in the world. Since a visit to the Academy of Sciences also includes the Morrison Planetarium (not recommended for kids under 7 years), a Natural History Museum, several other permanent exhibits and additional visiting exhibits by season…it’s a good place to plan to spend the better part of a day. At least. Get your hands stamped at lunch time and step outside into one of the most picturesque parts of Golden Gate Park. You can bring food of your own for a picnic or pick up lunch from the Academy Cafe, or look for the hot dogs and brats cart found most days in this part of the park. If you’re visiting with kids under 5, you may also want to take a play break in the Early Explorer’s Cove, where they’ll find toys, books, and a kid-size replica of a 1905 research schooner. And before you go, be sure to visit the living rooftop! Did I mention the penguin feedings? Oh, there’s a lot to do here. Tips: This place is not just popular with families but with adult travelers of all ages from all over the world. It can get very crowded and even reach max capacity on holidays. Try to get there early and go straight to the Osher Rainforest first; that’s where the wait to enter through the butterfly-proof air lock gets longer as the day progresses. View from the roof at The Suites at Fisherman’s Wharf (your morning coffee never tasted so good). It’s not easy coming up with one place to recommend families stay when visiting San Francisco. Especially when I know many are about to get the sticker shock of a lifetime when pricing hotels in the city. But The Suites at Fisherman’s Wharf gives you definite bang for your buck. And with with 1- and 2-bedroom suites sleeping up to 6 people, definite room for your brood. First off, you are right where you’ll want to be for much of your sightseeing, so you can hoof it. Or catch the cable car or bus lines right outside without wasting precious vacation time driving around and looking for (near impossible-to-find, and sometimes nearly vertical when you find it) parking. San Francisco’s Rainforest Cafe is full of surprises (don’t move!). With more restaurants per capita than any other city in the U.S. (and in a city that’s only 7 square miles! ), you’ll never have to look too far to find food in San Francisco. Finding a restaurant that’s a good fit for kids can be a bit more challenging, however. Though Chinese restaurants and any restaurant that calls itself a “diner” are usual pretty safe bets. Shelly Rivoli is the award-winning author behind the Travels with Baby guidebooks and Travels with Baby website and blog, and is the founding editor of Family Travel 411. When she isn't traveling with her husband and three children, she hangs her hat in the San Francisco Bay Area. 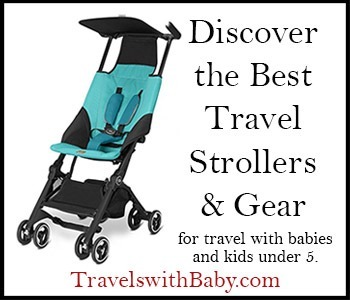 Follow her on Twitter: @travelswithbaby and Facebook: Shelly Rivoli. I used to live in San Francisco. Picnicking at Baker beach was one of my favorite things. My sister and her family live in San Francisco and, although I wish they lived closer, we love visiting them. Next time, we’ll be sure to hit the CA Academy of Sciences! I need to come visit! What great inspiration. We’ve visited San Francisco a number of times in recent years: for a City Hall wedding, a ROBLOX convention, and just to see friends. But we never saw this side of the city. In fact, I remember walking by the science museum and thinking that it would be cool to visit. Now I know that it is, thanks! Thanks for sharing these great SF activities. The park looks like a lovely way to spend to relax after a day of sightseeing.